I was wondering if anyone has any knowledge of the winged solar disk and its significance. That basically it is a symbol of protection, and a symbol of victory and royalty. I did read somewhere that it is thought to be linked to the brain as some link the eye of Horus to the pineal gland. Also other civilizations used variations of this symbol as well. I just find it very beautiful and wanted to know as much as possible about it. I feel there is more to it spiritually that I'm not finding on the web. I'm also curious of the significance of the sun being atop some's heads in hieroglyphs. I did try to find some answers a while ago by looking in the local library, but they mainly just had picture books with small unhelpful definitions. An image of victory and royalty as you said, more than a symbol of protection. The sun at the center is likely connected with the symbolism of Horus, so a reference to the bloodline of the pharaoh (again, royalty). There may be deeper spiritual connections that I'm not aware of but would be interested in learning. Please keep us posted on further findings. Will do. I want to know this symbol down to a T... the horns atop the wings, whether the number of feathers means anything, why they are (at least as I've noticed) always on the ceiling of temples or at the top of building arches. 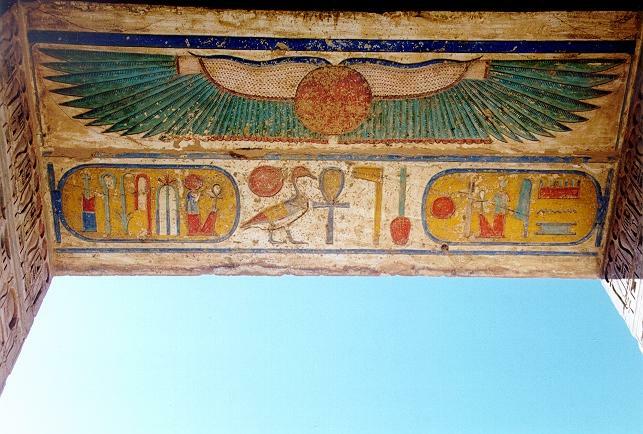 "The sun disc set between wings is known since the fifth dynasty: the symbol for the heavens had become a solar symbol. By this time Behdety had become identified with Horus, the divine ruler of Egypt, the royal uraeus serpents—protectors of the Egyptian kingship–were added, which since the New Kingdom wore at times the crowns of Upper and Lower Egypt respectively. The winged disk now symbolized the divine protection of the king. " To students of Asetianism I will leave two comments on this reference that may provide material when exploring such deeper studies. 1. There is remarkable phonetic resemblance between the name Sneferu, a Pharaoh from the Old Kingdom, and the word Senef, one of the older transliterations for Blood in Ancient Egyptian. It almost comes as a blending between the words Senef and Nefer. The importance of the word Nefer in Asetian history and in reference to the royal family of the Aset Ka during the Sep Tepy is legendary and well known by most of you. The elder son of Sneferu is no one else than Khufu himself. His mother, Queen MeresAnkh I. 2. The temple of Edfu, dedicated to Horus king, is one of the several known pillars of Asetian influence in Egypt still standing. An area where important battles in their history took place, later celebrated as a temple erected south of an incredibly old archeological location which I shall not describe in here. Elements of the temple were later reconstructed during the Ptolemaic period. Some symbolism was lost and intentionally destroyed, other was hidden, much still remains there for wise seekers to find. Thank you for such informative statements. "Further past the Hypostyle Hall, Festival Hall and the Hall of Offerings, lies the Sanctuary of Horus. It contains a shrine of polished black granite and an offering table." This interested me for obvious reasons. Thank you for the posting, Maktub. SRaindrop.......that video is for certain not what history teaches.......also, there are so many changes and mis-directions in that thing from the ACTUAL history that the movie is as far off center as the actual teaching of history is. It got off track from actual fact so many times it was like riding the subway and getting off at ever stop to catch another train. wow. Even the real Jews are laughing at that one. Thanks for the show. Always insightful information! Thank you very much Maktub. I really like this. Your contributions are priceless. Maxx, yeah the direct historical accuracy among some other aspects were definitely dodgy, but there were some things that just made sense or helped awaken subconscious connections to other things. Yes I remember viewing that about 1 and a half years ago on tv and then I watched it again later. This one I cannot agree with. But I certainly thank you for your search and post. If you feel comfortable sharing, how do you think the pyramids were built? For the purpose of opinion, I think that Thoth brought technology to the Egyptians. The stones were cut with tools we cannot duplicate even today. We cannot build a structure like that today. So thinking that the design and moving the stones were done by purely physical effort by manpower will not add up for me. I believe that sound and energy manipulation was used to maneuver and place them into position. Maybe something like Dynamo Jack uses. Thoth may well have given the technology. But any of my thoughts is pure speculation. I see that energy can be used and transferred to heal people I have never met or seen from pure thought across the planet from me.....I think the same can be used to produce something like this. It could even have been created by pure thought creation instantly like is done on higher realms and can be seen and demonstrated once you pass over. Who can argue against the concept that the structures were created by thought on a higher realm completely and them moved here into this lower dimension using thought creation entirely? That seems more likely to me based on what I am seeing here in my life than the description put forth in that video. We are many times falling into the trap of viewing this universe entirely with the limitations imposed in this 3rd dimension realm. So much more activity is happening right in front of us that we do not see or are aware of. Aberrantly the great pyramid was built within the reign of one pharaoh, so I don't see why the pyramids couldn't be built 'unconventionally'. I believe the great pyramid to be the result of ancient Asetian technology used for advanced initiation and energy work. It's much more a structure of great magick and power than a tomb which is a much later theory. These statements are very interesting and show how each person is so really different. None is completely wrong.... LOL. Like todays US education system. A wise individual from this site said that you will see where a person is in their walk in life by the statements they make. Again, more and more I see the statement, "We don't see things as they are, we see things as we are." as showing a persons present situation in life by the thought process. No position is wrong as we each are on a learning curve to be in constant change and we all serve a purpose so I am not belittling any concept. We all agree that the pyramids were constructed but we have a different angle we see them from. I also agree with the statement they were used in initiation along with another use which connects an energy grid all over the planet. Also being constructed to connect to exact planetary locations is a given fact. I personally see their design connected with the ability to use a portal to enter and communicate with other dimensions utilizing a black mirror type stone. This was used in group sessions by empowering one individual with a boost to ordinary energy. "IF" this is so then there is no way I can see conventional construction methods used to create them. If they were used in a higher purpose, then ordinary methods to build them has to be eliminated because you are mixing two things together that do not mesh like oil and water. To what degree the original use of these structures has moved away from today's "thinking" and no longer used for the actual reason in their construction we can only speculate and wait and see. Maxx wrote: We are many times falling into the trap of viewing this universe entirely with the limitations imposed in this 3rd dimension realm. So much more activity is happening right in front of us that we do not see or are aware of. we just have to open our eyes... or eye. Maxx about the pyramids being used to construct an energy grid, if you look at a map of the earth there are a lot of military bases built out in the middle of nowhere that happen to be locations where ley lines intersect. Maktub: Do you think that the basis of Asetianism was explored and created in the Temple of Edfu? Mainly the 7 Sacred Pillars? Maktub wrote: 1. There is remarkable phonetic resemblance between the name Sneferu, a Pharaoh from the Old Kingdom, and the word Senef, one of the older transliterations for Blood in Ancient Egyptian. It almost comes as a blending between the words Senef and Nefer. The importance of the word Nefer in Asetian history and in reference to the royal family of the Aset Ka during the Sep Tepy is legendary and well known by most of you. The elder son of Sneferu is no one else than Khufu himself. His mother, Queen MeresAnkh I.
I've been exploring a bit over my notes and I just want to share some thoughts. It is important to note here a few details, Khufu was not the only child of Sneferu, he had more Children. In cartouches the Pharaoh Sneferu is represented by the Nefer hieroglyphic and if we look at the remaining cartouches of the lists of kings we see that the three pharaohs are described in the Book of Orion as Khufu, Khafre, Menkaure in a more clearly vision where understanding is clear about the mysteries of each pharaoh and his creations. We know that the name Nefer belongs to the Royal Family and is represented in Asetian Bible by the main Shen Tiet(Blood of Aset), and also by the Secondary Shen,Erogenous. The problem with that dynasty is with Djedefre that is "accused" of killing his brother to reign the throne, this matter is not clear, and I have seen several interpretations of the two brothers. Anyway, my interpretation of this is that Khufu, Khafre and Menkaure, are Asetians and Djedefre is a Keeper. Not just because it was not relevant in the construction of the pyramids, but because his name so indicates. "Djed" is the symbol of Osiris which means stability, therefore, I believe that not only he protected the Asetian work for his successor as he loved his Family, such as a Keeper does. What do you think?